President Trump on Thursday announced the resignation of embattled Environmental Protection Agency Administrator Scott Pruitt, saying the scandal-plagued leader would step down on Monday. Pruitt has been dogged for months by an array of alleged ethical violations, with federal investigations into his actions numbering more than a dozen. Questions about Pruitt’s propriety first surfaced in March after reports that the administrator paid below market for an apartment he rented from the wife of an energy lobbyist. 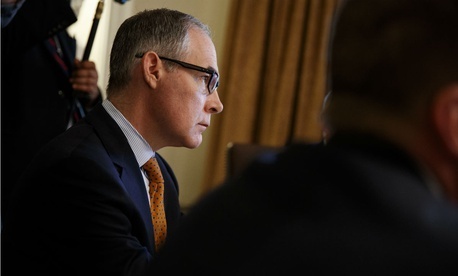 Subsequent scandals involved Pruitt’s spending on travel, security, and office supplies, as well as his habit of enlisting subordinates to conduct personal business on his behalf and improperly accepting gifts. The administrator will leave with a significant legacy on EPA’s operations, overseeing rollbacks of an array of regulations and refocusing it on a much narrower mission. Scandals aside, Pruitt was largely beloved by Republicans, who felt EPA had overstepped under President Obama, and despised by Democrats, who thought he favored industry interests over environmental protection. Even in announcing the resignation, Trump praised Pruitt’s tenure. Starting Monday, Trump said, current Deputy Administrator Andrew Wheeler will serve as the acting leader. Wheeler, a former coal lobbyist, was confirmed by the Senate in April. According to a resignation letter obtained by Fox News, Pruitt said reform at EPA under his leadership had “occurred at an unprecedented pace.” He called his decision to step down a difficult one because of the “transformative work” he was overseeing. “However, the unrelenting attacks on me personally, my family, are unprecedented and have taken a sizable toll on all of us,” Pruitt wrote. Many EPA employees are likely to rejoice at the news. "Nobody is going to be sad to see him go," one employee who has spent decades at the agency recently told Government Executive. "The question is then who do we get in his place."